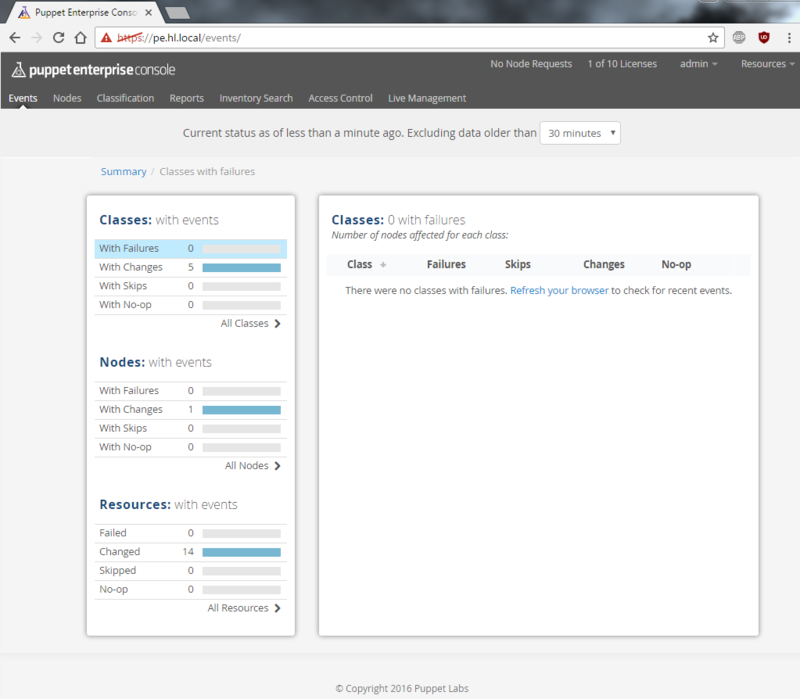 We are going to install Puppet Enterprise (PE) server on Red Hat Enterprise Linux 7. 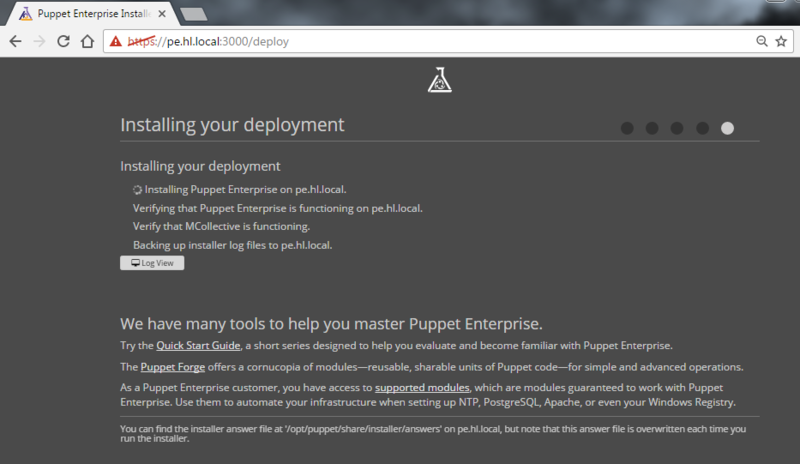 Note that we can download and install Puppet Enterprise on up to 10 nodes at no charge. No license key is needed to run PE on up to 10 nodes. This article is part of our RHCA studies. We use a RHEL 7.0 virtual server in this article. FQDN of the VM is pe.hl.local. Chrony has been configured for time keeping. DNS resolution has been configured on a separate lab DNS server. There are two different PE installation methods available, monolithic installation and split installation. We’re going to use the monolithic installation in this article. With monolithic installation the Puppet master, the PE console, and PuppetDB (with PostgreSQL) are all installed on one node. Because all components are on one node, this installation type is easier to install, upgrade and troubleshoot. We can later expand this installation type by adding compile masters to it. This type of installation is recommended for deployments up to 500 agent nodes. We’re not goint to put any direct links here as these tend to get broken, therefore please navigate to https://puppet.com/download-puppet-enterprise and download a PE tarball. The RHCA EX405 exam is based on Puppet Enterprise 3.6 and Satellite 6.1. Information has been confirmed by Red Hat Training using the Certification Comment Form (http://www.redhat.com/training/certification/comments.html). Taking the above into account, the PE version that we are going to use is 3.7.0 (mainly because 3.6 is no longer available for download on the Puppet website). We are aware that 3.7.0 release of Puppet Enterprise has been superseded and may contain known bugs or security issues, but for testing purposes it’s more important to match the EX405 exam environment than to use the newest version available. gpg: Good signature from "Puppet Labs Release Key (Puppet Labs Release Key) <[email protected]>"
As mentioned previously, a monolithic installation of PE deploys everything on a single VM: the Puppet master, the PE console and PuppetDB components. The web-based installer does not support sudo configurations with Defaults targetpw or Defaults rootpw. Make sure that /etc/sudoers file does not contain those lines. Also, the ‘ (single quote) is forbidden in all passwords. In brief, screen is a full-screen software program that can be used to multiplexes a physical console between several processes (typically interactive shells). Before you begin, choose an installation method. We've provided a few paths to choose from. 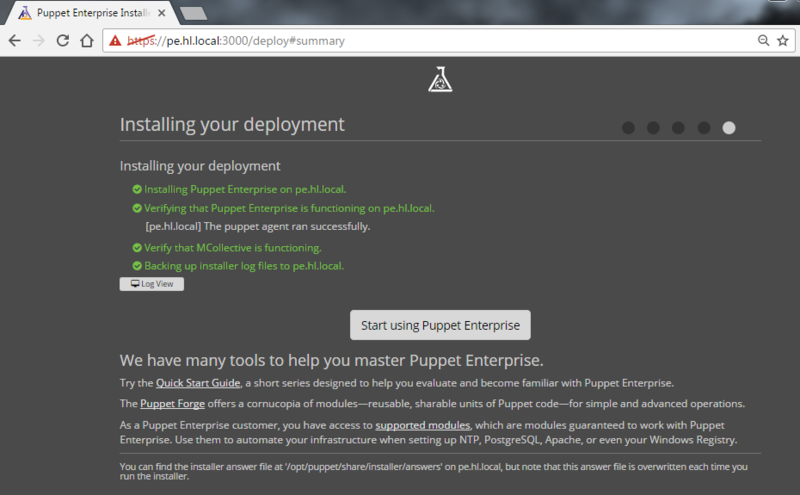 servers on your behalf, install Puppet Enterprise and get you up and running fairly quickly. which provides an overview on installing PE with an answer file. that port 3000 is reachable through the firewall. Be advise that we need to leave our terminal connection open until the installation is complete; otherwise the installation will fail. To be on a safe side, we will detach the screen session. The screen can be re-attached with “screen -r”. 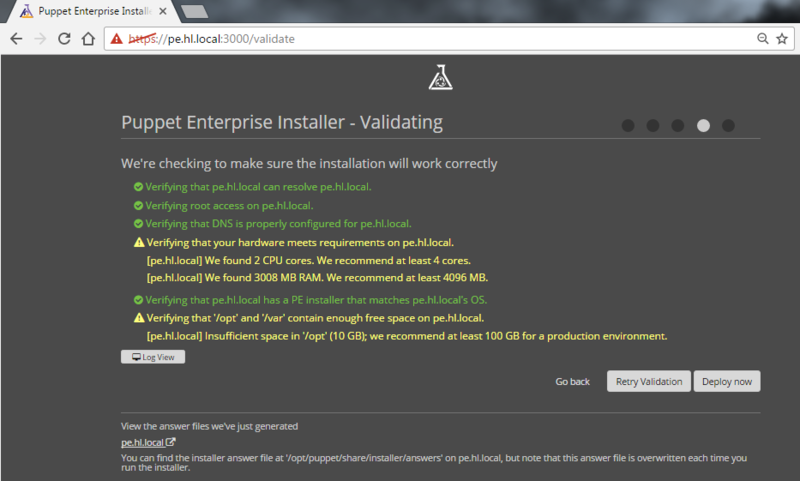 At this point, the PE installer will start a web server and provide a web address: https://pe.hl.local:3000. 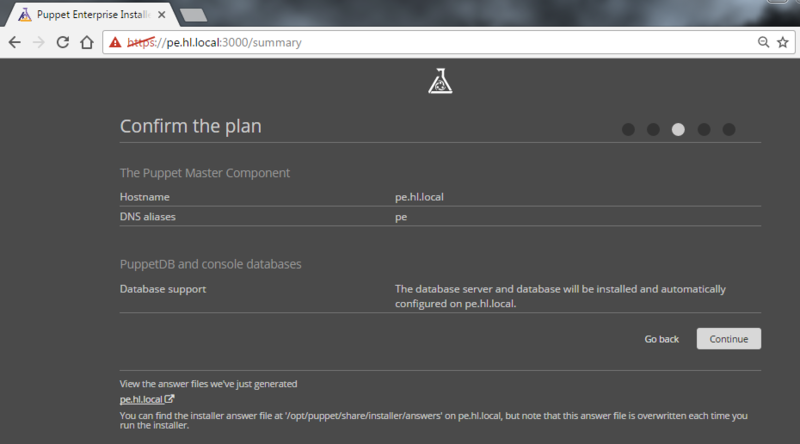 Copy the address into your browser and continue on to Monolithic Installation: Part 2. Follow the screenshots, they are left explanatory. 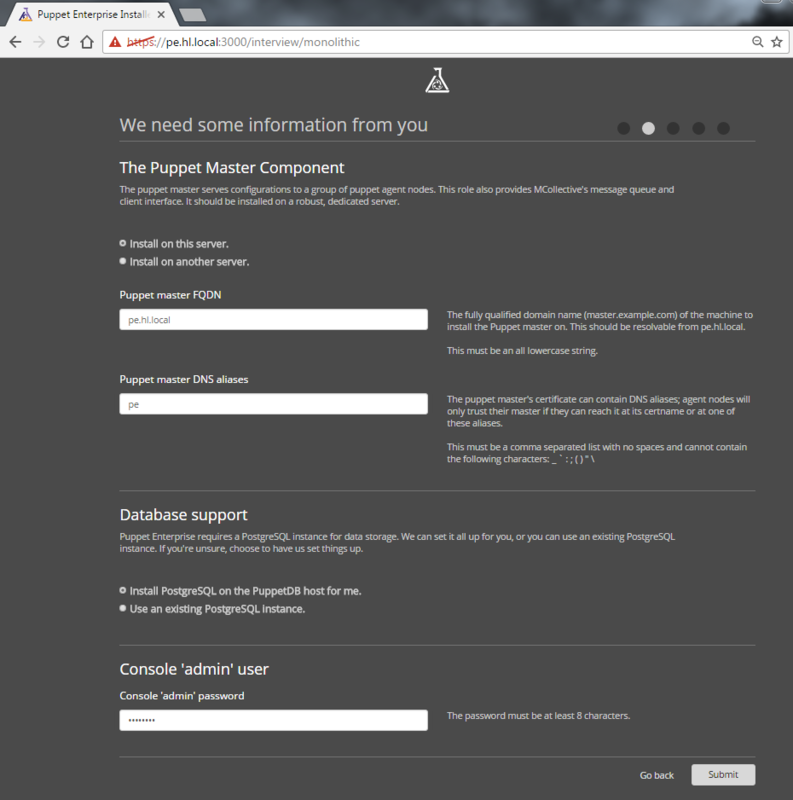 Puppet Enterprise has been installed to /opt/puppet, and its configuration files are located in /etc/puppetlabs. Puppet installation notes say that we have to ensure the following TCP ports are open: 443, 4433, 4435, 8140, 61613. This entry was posted in Linux and tagged CentOS, EX405, Puppet, Puppet Enterprise, RHCA, RHEL. Bookmark the permalink. If you notice any errors, please contact us. I think there is typo in the heading and the first line. wouldn’t it be “puppet” instead of “pupper”? You’re right, I just fixed that, thank you. You are welcome. You forgot one in the first line though.